March 1933 marked the beginning of a terrible chapter in world history. That chapter was entitled 'Nazi concentration camps'. After Hitler became Chancellor in Germany, his Nazi Party was given control over the police at the behest of Reich Interior Minister Wilhelm Frick and Prussian Acting Interior Minister Hermann Göring. Immediately after Hitler seized control, the first concentration camps were built. Initially the camps were used to hold and torture political opponents and union organizers. At this time the camps held some 45,000 prisoners in horrid conditions. In 1934 things went from bad to worse when Heinrich Himmler's SS took full control of the police and concentration camps throughout Germany. The role of concentration camps changed dramatically. They now also held the so-called "racially undesirable elements" of German society, such as Jews, criminals, homosexuals, and Romani. Before this change occurred the number of people being held in the camps had dropped to 7,500, but it now grew again to 21,000 souls. Astonishingly, that number grew and grew to peak at 715,000 in January 1945. Of this rather alarming number of people, some 200,000 had been deported from Vichy France. 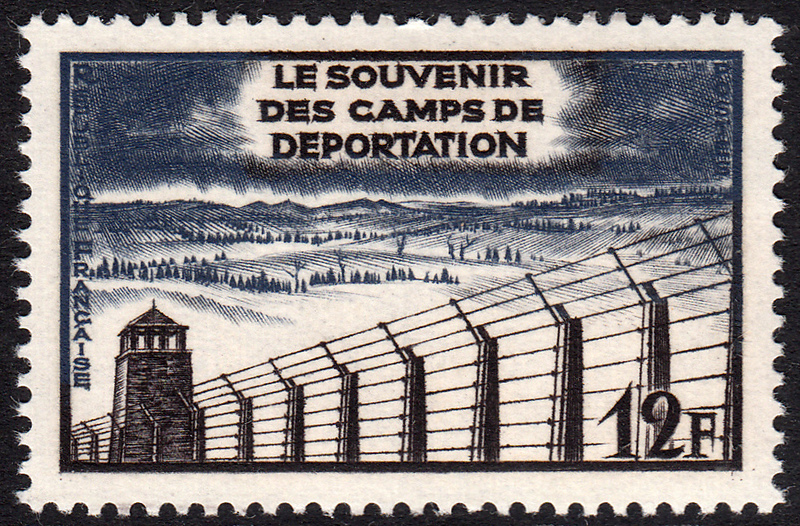 On 25 April 1955 France issued a stamp in remembrance of the 200,000 French people deported to Nazi concentration camps during WWII. The stamp was designed and engraved by Albert Decaris. 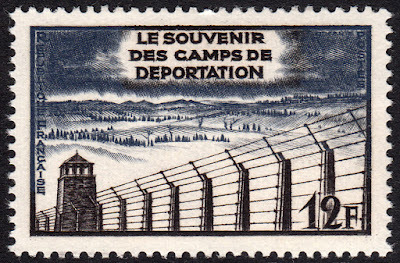 This stamp is a poignant reminder of the desolation and stark terror of being trapped behind walls of barbed wire with very little chance of leaving alive. One shutters to think what it must have been like for all those poor, wretched souls. What a great design capturing the atmosphere: the grim fencing of the camp, the bleak wintry day, the bare trees in the empty hilly country in the distance, the dark skies, the commemorative lettering to match .... The mark of a true master.